While Shame may have dropped their debut record, the exceptional Songs of Praise, a mere six months ago, the South Londoners exude a level of skill and confidence well beyond their years. Their potent brand of post-punk has resonated with music lovers of all ages, uniting an eclectic fanbase that thrives off the quintet's camaraderie and passion. "At the end of the day, for me personally, and I'm sure it probably applies to the rest of the band, we're lucky that we have music because music is the greatest form of escapism I've found," frontman Charlie Steen told Exclaim! last month. 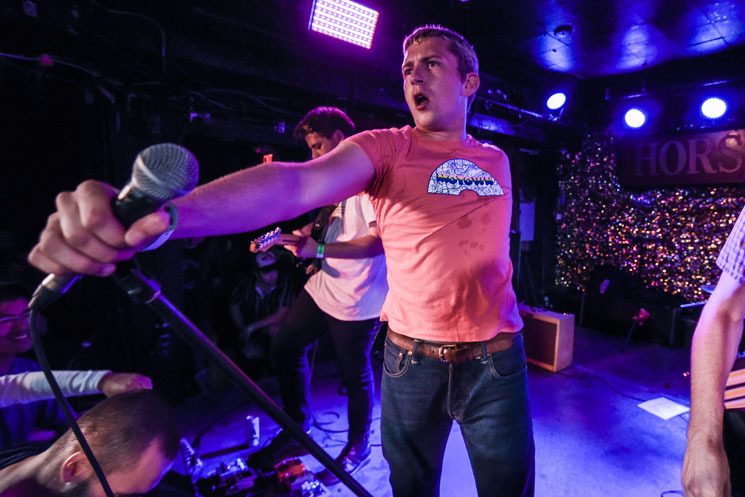 Shame recreate that same form of escapism in their live show, enrapturing onlookers and delivering individually electrifying performances that are impossible to ignore. On Monday night, an exceptionally adoring crowd helped Steen celebrate his 21st birthday and from the moment he stepped onto the sweltering stage until the final notes of frenetic encore "Donk" had faded, Steen held the audience in the palm of his hand. He effortlessly commanded attention by looking directly into their eyes rather than over their heads, arms outstretched and radiating with conviction like a preacher. "Dust on Trial," Songs of Praise's powerful opener, kicked off the 12-song set with a vengeance, and both band and audience never looked back. Opting to spend most of the show in the thick of the crowd, interlocking fingers, rubbing foreheads and sharing the mic with exhilarated audience members, Steen's longtime friends and loyal bandmates held down the stage with ease. Bassist Josh Finerty's prominent, heavy tone never faltered, despite his energetic kicks and leaps, while lead guitarist Sean Coyle-Smith hurtled hypnotic, tuneful riffs with force and precision. Eddie Green was stoic on rhythm guitar, and drummer Charlie Forbes tied every song together with each palpable hit of his kit. In addition to christening Toronto with live performances of two songs that have yet to see official release, Shame masterfully tore through Songs of Praise's ten tracks with precision and ease. Steen's sweat-soaked shirt was tossed aside just in time for the soaring yet sardonic "One Rizla," amplifying his audience engagement as chaotic cuts like "Lampoon" and "Gold Hole" flung the pit into a frenzy. Steen serves as a shaman and the introspective lyrics he's penned since the ripe age of 16 are his sermons. The tolerant, cathartic energy that Shame foster in their live shows made it safe for the worshipping audience to completely lose themselves in devotion and left them aching for more. With the amount of raw talent packed into their inaugural full-length, it's thrilling to fantasize about the ways in which these endearing Brits will continue to evolve. Last night's life-affirming performance proved that Shame are the name, and the world is theirs to conquer.